Beta cell destruction in human type 1 diabetes occurs through the interplay of genetic and environmental factors, and is mediated by immune cell infiltration of pancreatic islets. In this study, we explored the role of mast cells as an additional agent in the pathogenesis of type 1 diabetes insulitis. Pancreatic tissue from donors without diabetes and with type 1 and 2 diabetes was studied using different microscopy techniques to identify islet-infiltrating cells. The direct effects of histamine exposure on isolated human islets and INS-1E cells were assessed using cell-survival studies and molecular mechanisms. A larger number of mast cells were found to infiltrate pancreatic islets in samples from donors with type 1 diabetes, compared with those from donors without diabetes or with type 2 diabetes. Evidence of mast cell degranulation was observed, and the extent of the infiltration correlated with beta cell damage. Histamine, an amine that is found at high levels in mast cells, directly contributed to beta cell death in isolated human islets and INS-1E cells via a caspase-independent pathway. These findings suggest that mast cells might be responsible, at least in part, for immune-mediated beta cell alterations in human type 1 diabetes. If this is the case, inhibition of mast cell activation and degranulation might act to protect beta cells in individuals with type 1 diabetes. Piero Marchetti and Vincenzo De Tata contributed equally to this study. The online version of this article (doi: 10.1007/s00125-015-3734-1) contains peer-reviewed but unedited supplementary material, which is available to authorised users. The development and progression of type 1 diabetes results from the autoimmune destruction of pancreatic beta cells. This autoimmune process is triggered by interactions between genetic and environmental factors [1, 2], but the exact stimuli and cells participating in this process remain to be determined. This limited understanding of the ultimate triggers and effectors of beta cell death in type 1 diabetes hampers ongoing efforts to prevent or cure the disease. In most patients, the early stages of type 1 diabetes are associated with immune cell infiltration specifically targeting the islets of Langerhans, which has been termed insulitis [1, 2, 3]. Well-defined histological criteria to detect insulitis have recently been proposed, i.e. ≥15 CD45+ (leucocyte common antigen) cells in a minimum of three islets of approximately 150 μm diameter . There is also agreement that the majority of infiltrating cells are of lymphocytic nature, with a predominance of CD3+CD8+ cells in recent-onset type 1 diabetes and an increasing contribution of B lymphocytes (CD20+) at later stages [4, 5]. Innate immunity also plays a role in this process. Thus, significant numbers of islet-infiltrating macrophages have been observed in recent-onset type 1 diabetes [4, 6], becoming the most prominent infiltrating cell type in islets devoid of insulin-positive cells . More recently, the presence of leucocytes, including neutrophils, has been observed in the pancreases of individuals with type 1 diabetes, both at onset and at later stages of the disease [7, 8]. In the present study, we show that mast cells are additional agents in the human type 1 diabetes islet-infiltrating cell scenario. These innate immunity cells are normally localised near body surfaces and are consequently considered to be first-line defenders against several environmental insults . Following activation through the classical IgE-dependent or alternative non-IgE-dependent pathways , mast cells play a key role in allergic reactions [8, 10, 11]. They possess chemotactic as well as immunomodulatory properties [9, 12]. Interestingly, a role has been proposed for mast cells in autoimmune disorders such as Crohn’s disease, multiple sclerosis and rheumatoid arthritis [13, 14], and these cells might also contribute to autoimmune diabetes in experimental animal models such as the BioBreeding rat [15, 16]. In this study, we show that mast cells infiltrate pancreatic islets during insulitis in human type 1 diabetes and that the extent of the infiltration correlates with beta cell damage. In addition, we show that histamine, an amine that is found at high levels in mast cells, can directly contribute to beta cell death via a caspase-independent apoptotic pathway. Pancreatic samples from seven multiorgan donors without diabetes, six with type 1 diabetes and seven with type 2 diabetes were studied (see Table 1 for details). Approval was obtained from the local ethics committee at the University of Pisa. 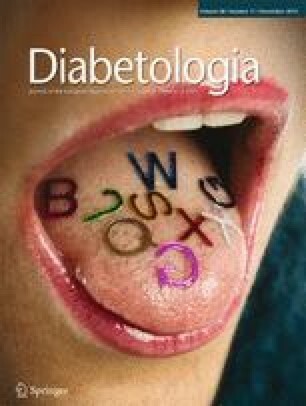 The type of diabetes was identified based on medical records, anti-GAD autoantibody status and/or the morphological and ultrastructural appearance of pancreatic islets (see electronic supplementary material [ESM] Fig. 1). Pancreatic tissue samples were taken before the islet isolation procedure. Samples were prepared for electron and optical microscopy as previously described [17, 18]. The specimens acquired for electron microscopy were also used to obtain semithin sections (500 nm thickness) for light microscopy analysis. To study mast cells in semithin sections, staining was performed with a 1:1 mixture of toluidine blue (1% in twice-distilled water) and methylene blue (1% in twice-distilled water) for 15 min at 37°C, with identification of mast cells by light microscopy based on metachromatic staining . For immunohistochemistry studies , specimens were fixed in 10% neutral-buffered formalin (Sigma-Aldrich, St Louis, MO, USA) and embedded in paraffin. Sections (2 μm) were then cut, deparaffinised and rehydrated through passages in xylene (Sigma-Aldrich) and graded ethanol (Sigma-Aldrich) solutions. Afterwards, samples were rinsed in PBS and endogenous peroxidases, and inhibited by treatment for 10 min with 0.5% hydrogen peroxide. The sections were subsequently rinsed in PBS and treated with normal goat serum blocking solution (Vector Laboratories, Burlingame, CA, USA) at 1:50 dilution for 30 min. To identify mast cells, we used a monoclonal mouse antibody against tryptase (a mast cell marker ) (clone G3; Millipore, Merck, Vimodrone, Italy) at 1:5,000 dilution, with incubation performed overnight at 4°C. After rinsing with PBS, sections were incubated with the biotinylated secondary antibody (Cell Marque, Rocklin, CA, USA) for 15 min, followed by treatment with the horseradish peroxidase streptavidin label (Cell Marque) for an additional 15 min. Sections were then rinsed in PBS and the diaminobenzidine substrate (Vector Laboratories) was applied for 40 s. After rinsing in double-distilled water, sections were counterstained with Mayer’s haematoxylin solution (Sigma-Aldrich), rinsed under running tap water, and then placed in 2% ammonia solution. Sections were finally dehydrated in ethanol, cleared in xylene and covered with mounting media (Sigma-Aldrich). Images were acquired at ×40 magnification using a Leica DM5500 B microscope (Leica, Wetzlar, Germany). For the electron microscopy studies (sections 60 nm thickness), mast cell identification was based on the particular ultrastructural appearance of these cells, including a monolobed nucleus, surface architecture composed of narrow, elongated folds, the presence of typical cytoplasmic granules and the absence of cytoplasmic glycogen aggregates [21, 22]. Lymphocytes and macrophages were identified by electron microscopy, as previously described [23, 24]. Immune system cell counts per mm2 were performed in semithin sections of pancreatic tissue. The same cells were examined by electron microscopy in consecutive ultrathin section to confirm the identification and assess ultrastructural characteristics (Fig. 1). Counts of inflammatory cells infiltrating the pancreatic islets and of beta cells per islet (together with the calculation of beta cells with signs of apoptosis) were performed with 58 islets (20 from donors without diabetes, 18 from donors with type 1 diabetes and 20 from donors with type 2 diabetes) and on tissue sections where recognisable islets (independent of the presence of immune system cells) were identified. The number of pancreatic non-consecutive semithin sections (one every ten sections) examined to reach these numbers of islets was 145 in control cases (with 3 ± 1 blocks and 21 ± 8 sections per patient), 568 in samples from donors with type 1 diabetes (10 ± 3 blocks and 95 ± 26 sections per patient) and 240 in samples from donors with type 2 diabetes (5 ± 1 blocks and 34 ± 15 sections per patient). All counts were independently performed by two investigators unaware of sample identity (samples were identified only by randomly assigned numbers). Quantification of beta cells (including those with apoptotic features) was performed as previously detailed [18, 25, 26, 27]. Beta cells were identified based on the presence of typical insulin granules, while apoptotic beta cells were identified based on the appearance of marked chromatin condensation and/or blebs (ESM Fig. 2), as previously reported by us and others [18, 25, 28]. Islets isolated from independent non-diabetic donors were also studied histologically after exposure to histamine (see below). In such cases, in addition to electron microscopy experiments, immunofluorescence analysis was performed to identify insulin-containing cells and TUNEL-positive cells, similar to previously published procedures [17, 29]. To do this, pancreas sections were deparaffinised, rehydrated through passages in xylene and graded ethanol solutions, and rinsed in PBS. Antigen retrieval was then performed using citrate buffer (pH 6) in a microwave at 350 W for 5 min. Insulin immunostaining was performed using a primary, polyclonal guinea pig anti-insulin antibody (Abcam, Cambridge, UK) at 1:100 dilution, applied for 1 h at room temperature, followed by treatment with the secondary antibody (Alexa Fluor 594-conjugated donkey anti-guinea pig IgG; Jackson ImmunoResearch, Pero, Italy) at 1:200 dilution for 1 h at room temperature. The presence of apoptotic cells was confirmed using the In Situ Cell Death Detection Kit (Roche, Mannheim, Germany). Sections were incubated with a reaction solution containing the terminal deoxynucleotidyl transferase enzyme and fluorescein-dUTP labelled nucleotides (TUNEL reaction mixture) (In Situ Cell Death Detection Kit; Roche) for 1 h at 37 C. Analysis was performed at ×400 magnification using a Leica DM5500B microscope. All counts were independently performed by two investigators unaware of sample identity (samples were identified by randomly assigned numbers). Isolated islets were prepared from the pancreases of 18 independent non-diabetic multiorgan donors (age 69 ± 15.5 years; ten male; BMI 26.2 ± 3.1 kg/m2; cause of death: 14 cardiovascular events and four traumas; duration of intensive care unit stay 3 ± 2 days; pancreas cold ischaemia time 18.3 ± 6.2 h) by collagenase digestion followed by density gradient purification, as previously reported [18, 26]. After isolation, the islets were maintained for 2–3 days in M199 medium, containing 5.5 mmol/l glucose, supplemented with 10% serum and antibiotics. Batches of approximately 1,000 islets were then cultured for 72 h in M199 medium supplemented with 10% (vol./vol.) serum and 100 U/ml penicillin, 100 μg/ml streptomycin, 50 μg/ml gentamicin and 750 ng/ml amphotericin B, and either with or without the addition of 100 μmol/l histamine dihydrochloride (all Sigma-Aldrich). In some experiments, the effect of caspase inhibition by 20 μmol/l Z-VAD-FMK (Promega, Madison, WI, USA) was also tested. Isolated human islets were lysed in buffer containing 40 mmol/l Tris, 4% CHAPS, 7 mol/l urea, 2 mol/l thiourea and 1% DTT, and supplemented with a protease inhibitor cocktail (Roche). The lysates were centrifuged to remove cellular debris and the protein amount was evaluated using the Bradford method. A western blot assay of caspase 9 and 3 activation in human islets incubated for 24 h with histamine (see above) was performed as previously described . Briefly, equal amounts of total protein were heated at 100°C for 5 min, resolved by SDS-PAGE and electroblotted onto nitrocellulose membranes. Immunodetection was performed after overnight incubation with antibodies for cleaved caspase 9 and 3 (Cell Signaling, Danvers, MA, USA), and α-tubulin (Cell Signaling) was used as the loading control. Gene expression was determined as previously described [18, 30, 31]. Briefly, total RNA was extracted using the PureLink RNA Mini Kit (Life Technologies, Carlsbad, CA, USA) and quantified by absorbance at A260/A280 nm (ratio >1.9) in a NanoDrop 2000C spectrophotometer (Euroclone Spa, Pero, Italy). RNA integrity was assessed using an Agilent 2100 Bioanalyzer (Agilent Technologies, Cernusco sul Naviglio, Italy). For quantitative PCR experiments, total RNA was reverse-transcripted from 1 μg using a SuperScript VILO cDNA Synthesis Kit (Life Technologies). The oligonucleotides of interest were obtained from assay-on-demand gene expression products (Life Technologies). mRNA levels were quantified and normalised for β-actin using a ViiA 7 analyser (Life Technologies). The activity of mitochondrial complex I was assayed in control and histamine-treated (72 h) INS-1E cells (kindly provided by C. Wollheim; University of Geneva, Geneva, Switzerland) using a commercially available kit (Mitochondrial Complex I Activity Assay Kit; Millipore, Darmstadt, Germany) and following the manufacturer’s instructions. INS-1E cells were cultured in a humidified atmosphere containing 5% CO2 in complete medium composed of RPMI 1640 supplemented with 10% heat-inactivated FCS, 1 mmol/l sodium pyruvate, 50 μmol/l 2-mercaptoethanol, 2 mmol/l glutamine, 10 mmol/l HEPES, 100 U/ml penicillin and 100 μg/ml streptomycin . The mitochondrial membrane potential in control and histamine-treated INS-1 cells was measured cytofluorimetrically, as previously described , with a FACScan equipped with CellQuest software (BD Biosciences, Franklin Lakes, NJ, USA). Results are given as means ± SD, and differences between groups were assessed using the two-tailed Student’s t test or ANOVA with Bonferroni correction, as appropriate. Unilinear regression analysis was also performed to evaluate correlations between selected variables. A p value of < 0.05 was considered statistically significant. As illustrated in Fig. 1 (see also Methods), consecutive semithin and ultrathin sections of pancreases from donors with type 1 diabetes showed infiltrates containing different inflammatory cells, including lymphocytes, macrophages and mast cells. Representative images of mast cells identified by different microscopy techniques are shown in Fig. 2, demonstrating the presence of this cell type in non-endocrine tissue as well as in both the peri- and intra-insular regions. Quantification of mast cells in non-endocrine tissue was performed using semithin sections, and the count of these cells at the periphery of and inside islets was also performed using electron microscopy analysis (Fig. 2a–c). There were 8.2 ± 2.5 and 18.2 ± 4.3 mast cells/mm2 in pancreatic samples from donors without diabetes and with type 1 diabetes, respectively (p < 0.05), whereas the number of mast cells in specimens from donors with type 2 diabetes (6.6 ± 1.3 per mm2) was similar to that of controls. In agreement with previous reports [5, 33, 34] we observed that lymphocyte and macrophage cell numbers were significantly increased in samples from donors with type 1 diabetes, while there was an increase in macrophages but not in lymphocytes in type 2 diabetes pancreatic sections. Thus, lymphocyte numbers (cells/mm2 pancreatic tissue) were 2.8 ± 1.3 in samples from non-diabetic donors, 36.4 ± 7.3 in samples from donors with type 1 diabetes (p < 0.05 vs no diabetes and type 2 diabetes) and 2.9 ± 1.0 in samples from donors with type 2 diabetes. Macrophage numbers (cell/mm2 pancreatic tissue) were 5.2 ± 1.8 in non-diabetic, 13.2 ± 1.2 in type 1 diabetic (p < 0.05 vs non-diabetic) and 18.1 ± 3.0 in type 2 diabetic (p < 0.05 vs non-diabetic) samples. Details on the number of different pancreatic tissue infiltrating cells per patient are shown in ESM Fig. 3. The number of beta cells counted (cells/mm2 pancreatic tissue) was 643, 499 and 598 in samples from control and type 1 and 2 diabetic donors, respectively. The proportion of islet beta cells with signs of apoptosis was 0.5 ± 0.4% in samples from control donors, 6.5 ± 3.8% in samples from donors with type 1 diabetes and 4.9 ± 1.5% in samples from donors with type 2 diabetes (both p < 0.05 vs controls). The proportion of islets with at least one mast cell was 27%, 94% and 33%, respectively (p < 0.05 for type 1 diabetes vs no diabetes; non-significant for type 2 diabetes vs no diabetes). Mast cell numbers per islet per patient were 0.6 ± 0.3 in control samples, 2.0 ± 0.7 in type 1 diabetes samples (p < 0.05 vs control and type 2 diabetes) and 0.7 ± 0.2 in type 2 diabetes samples (ESM Fig. 4). In addition, in control and type 2 diabetes samples, practically all the mast cells were located at the periphery of the islets, whereas in the type 1 diabetes samples, about 40% of the mast cells (0.8 ± 0.3 per islet per patient) were located within the islets (Fig. 2d–f). Of interest, several mast cells in type 1 diabetes samples appeared to be at least partially degranulated (Fig. 3). With respect to the other mononuclear cells (ESM Fig. 4), the number of macrophages located at the periphery and within the islets was 0.9 ± 0.2 per islet per patient in control samples, 1.9 ± 0.4 per islet per patient in type 1 diabetes samples (p < 0.05 vs control) and 4.3 ± 0.7 per islet per patient in type 2 diabetes samples (p < 0.05 vs control), with three- to fourfold higher values (both p < 0.05 vs non-diabetic) for intra-islet macrophages in type 1 (0.3 ± 0.1) and type 2 (0.4 ± 0.3) diabetes compared with non-diabetic control samples (0.1 ± 0.06). The corresponding figures for lymphocytes were 0.2 ± 0.1 per islet per patient in non-diabetic samples (all at the periphery), 0.9 ± 0.3 per islet per patient in type 1 diabetes samples (of which 0.8 ± 0.3 per islet per patient were within the islet, p < 0.05 vs non-diabetic) and 0.7 ± 0.2 in type 2 diabetes samples (of which only 0.1 ± 0.1 per islet per patient were within the islet, not significantly different vs no diabetes and p < 0.05 vs type 1 diabetes) (ESM Fig. 4). In type 1 diabetes samples, the number of mast cells per mm2 of pancreatic tissue showed a trend towards an inverse correlation with the duration of diabetes (r = 0.73, p = 0.06), suggesting attenuation of infiltration over time; however, the number of islet-infiltrating mast cells was not affected by disease duration (r = 0.10). Interestingly, the number of beta cells with signs of apoptosis was positively correlated with the number of mast cells in and around islets (per islet: r = 0.62, p < 0.01; per patient: r = 0.75, p = 0.05). Because histamine is one of the most abundant compounds stored by mast cells [9, 14], we next tested if direct exposure of isolated non-diabetic human islets to this amine affects beta cell survival. After 72 h incubation, the proportion of beta cells with signs of apoptosis was 1.0 ± 0.6% in control islets (out of 257 beta cells counted by electron microscopy) and 6.1 ± 2.0% (out of 306 beta cells counted) in islets incubated with 100 μmol/l histamine (p < 0.01). Accordingly, the proportion of insulin-positive cells showing TUNEL-positive nuclei (ESM Fig. 5) was 2.8 ± 1.6% in histamine-treated human islets (301 insulin-positive cells counted), which was significantly higher than in islets that were not exposed to the amine (0.6 ± 0.5%, 393 insulin-positive cells counted). In order to investigate the mechanisms involved in histamine-related beta cell apoptosis, we tested the activation of caspases 9 and 3 by western blotting. As shown in Fig. 4a, no difference in cleaved caspases was observed in islets that were either exposed or not exposed to histamine. In line with these observations, the presence of a caspase inhibitor did not significantly reduce the extent of beta cell apoptosis following histamine exposure, as assessed with an electron microscope (Fig. 4b). Of note, an intrinsic form of caspase-independent apoptosis has been described . In this case, molecules such as apoptosis-inducing factor (AIF) are released from the mitochondria, translocate to the nucleus and mediate DNA fragmentation . Intriguingly, we observed significantly increased expression of AIF (also known as AIFM1) in human islets exposed to histamine (Fig. 4c). The impact of histamine on mitochondria was confirmed by experiments performed in insulin-producing INS-1E cells. Thus, we noticed that a 72 h incubation with 100 μmol/l histamine was associated with inhibition of mitochondrial complex I enzyme activity (p < 0.05) (Fig. 4d) and depolarisation of the mitochondrial membrane potential, as assayed by cytofluorometry (p < 0.01) (Fig. 4e). To the best of our knowledge, mast cell infiltration of human pancreatic islets has not previously been described for individuals with type 1 diabetes. In this study, we found that the number of these innate immune system cells was increased in islets from donors with type 1 diabetes and correlated with the proportion of beta cells with signs of apoptosis. These findings cannot be explained by differences in cause of death, duration of intensive care unit stay or pancreas cold ischaemia time, which can all affect the degree and composition of pancreas infiltration , since these variables were similar between control donors without diabetes and donors with type 1 diabetes (Table 1). In addition, mast cell infiltration was not seen in islets from donors with type 2 diabetes, suggesting that this feature is peculiar to type 1 diabetes. Finally, we have demonstrated that histamine, an amine that is found at high levels in mast cells, can induce beta cell apoptosis, possibly by activating an intrinsic, caspase-independent apoptotic machinery. This pathway is characterised by mitochondrial dysfunction and release of mitochondrial proteins such as AIF, which can directly fragment DNA without the need for caspase activation . In line with this possibility, we observed that histamine upregulates AIF expression and that the use of a caspase inhibitor does not prevent beta cell apoptosis. Overall, the present results are coherent with the observation of human islet infiltration by other cells of the innate immune system [7, 8] and with the concept that mast cells might be involved in autoimmune processes, including experimental diabetes [13, 15, 16]. A recent study, however, questioned the role of mast cells in the pathogenesis of diabetes in the NOD mouse , suggesting differences between species regarding the role of different cellular effectors of innate immunity in causing beta cell damage. Of interest, in our study, mast cells were also present in islets obtained from individuals with long-term diabetes, suggesting that components of the innate immune response might continue to contribute to beta cell dysfunction and death even after putative full activation of the adaptive immune response. Similar observations have been reported for leucocyte infiltration . At the moment, it is not clear why mast cells move into the islets in individuals with type 1 diabetes. These cells are actively involved in the recognition of viruses and viral products . Since viral infections have been implicated in the pathogenesis of beta cell damage in type 1 diabetes , it is conceivable that the presence of a viral infection and local inflammation in islets attract these cells. In line with this, mast cells are attracted to tissues expressing chemokine (C-C motif) ligand (CCL)2, CCL3, CCL5, chemokine (C-X-C motif) ligand (CXCL)2 and CXCL4, among others , and human islets exposed to viral infection  or proinflammatory cytokines [40, 41] express high levels of these chemokines. Of note, besides the above-described invasion of pancreatic islets, we also observed an increased number of mast cells and other immune cells in the exocrine pancreas. It has been previously reported that pancreatic weight and volume are significantly reduced in individuals with type 1 diabetes , and recent findings indicate that leucocytes and CD8 and CD4 T cells infiltrate the exocrine pancreas in these individuals [7, 43]. Taken together with our present findings, these studies support the concept that inflammation of the pancreas as a whole might contribute to the pathogenesis of type 1 diabetes . Intriguingly, electron microscopy examination showed that at least some islet-infiltrating mast cells are partially degranulated, indicating functional activation. Mast cells can be activated through the classical IgE-dependent or the alternative non-IgE-dependent pathways via toll-like receptors . In preliminary immunohistochemical experiments, we have observed that the mast cells in the pancreatic tissue of type 1 diabetes patients are anti-IgE negative (L. Martino and M. Masini, unpublished observations), favouring the view of an activation triggered via toll-like receptors . Once activated, mast cells can recruit other inflammatory and immune cells  and/or directly damage beta cells by releasing histamine (as suggested by our results), with both effects potentially contributing to beta cell dysfunction and death. In line with this hypothesis, histamine receptors are produced in mouse and human pancreatic beta cells , and both pizotifen, an inhibitor of histamine action, and disodium cromoglycate, an inhibitor of mast cell degranulation, suppress diabetes development in C57B1/6J mice treated with multiple low doses of streptozotocin . In conclusion, the present observations suggest that mast cells make a putative contribution to immune-mediated beta cell dysfunction and death in individuals with type 1 diabetes. If these observations are confirmed by additional studies with larger numbers of samples, it will suggest that inhibitors of histamine action or mast cell degranulation might be considered as adjuvant therapies to protect beta cells in human type 1 diabetes. This work was supported by grants from the EU (projects Naimit and BetaBat, in the Framework Programme 7 of the European Community); the Italian Ministry of University and Research (PRIN 2010–2011); the Fonds National de la Recherche Scientifique (FNRS), Belgium; and the Communauté Française de Belgique-Actions de Recherche Concertée (ARC). LMart, MM, DLE, PM and VDT conceived the study, designed the experiments, analysed and interpreted data, and wrote the manuscript. UB, FF, MB, LMars, MO, MS, FS, DC, FD and TCN contributed to the acquisition and interpretation of data. All the authors revised the manuscript critically for important intellectual content and gave final approval of the version to be published. VDT is the guarantor of this work and, as such, had full access to all of the data in the study and takes responsibility for the integrity of the data and the accuracy of the data analysis.